Welcome to week 2 of The Princess Bride Readalong! We will be discussing Milestone 2 this week. Please see this post for the full schedule. If you haven't read up to this point, remember beyond this paragraph there may be spoilers. There was a lot more action in this section, The Announcement, than last week's reading. Prince Humperdink is not much of an orator, is he? Buttercup shows some potential as a leader of the people though. Buttercup meets the 3 assassins: Vizzini, the wily Sicilian, Inigo, the swordsman, Fezzik, the large Turk. I liked finding out the backstory for Inigo and Fezzik. Inigo has spent years learning how to become a master fencer so that he can find and kill the 6 fingered man who killed his father. I wonder who that is? Figures the one time Domingo agrees to make a sword for someone the guy turns out to be cheap, gutless jerk. Inigo was brave to stand up to him. Fezzik was a giant from the day he was born. His parents seemed a lot like "stage parents" pushing him to perform in fights that he hated. He's a sensitive boy and afraid to be alone. 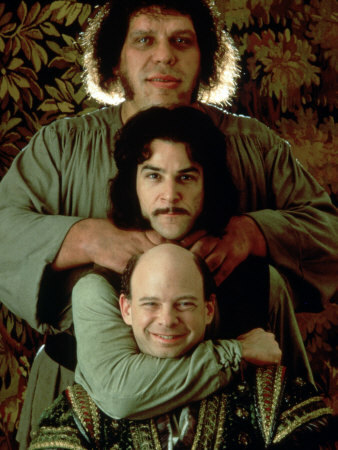 The evil genius Vizzini uses the skills of these 2 reluctant assassins to kidnap Buttercup but the Man in Black follows them, overtakes them, and incapacitates Inigo and Fezzik. He doesn't have so much respect for Vizzini who he disposes of by trickery. Finally, the Man in Black has Buttercup to himself. What did you think of Goldman's interruption and request to contact the publisher? Apparently, people did write to the publisher but instead of the reunion scene they received this letter detailing a legal battle with the Morgenstern estate. Seems a bit disappointing. What were your thoughts on Milestone 2? Still enjoying the story? Leave your thoughts in the comments section or leave a link to your own blog post. I will post them in the body of the post as they arrive. I found the interruption and request to send a letter to the publisher hilarious. And you even found out what people got in return! I was wondering about that. The answer - though slightly disappointing - fits. 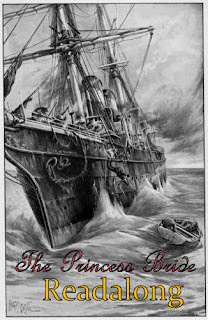 A long winded account that nobody wants to read, lol. I think you both mention most of what I was thinking about. I absolutely loved hearing about Fezzik's past, and I think it fits in with his character 110%. What I really didn't like was Buttercup's final words..."I can live without love." I know the idea is that she'd rather him be alive, but seriously? I thought her response in the movie fit in perfectly, but that comment from her almost made me feel like she didn't care!! Katie- Yeah, it didn't seem like the best way to phrase it. This part was great fun, and I loved finding more out about Inigo and Fezzick, but then I wanted to know a lot more about the others too! I think Buttercup's line just adds to the humor. It's kind of unexpected and unconventional, which fits right in with the rest of the story. It certainly doesn't help my opinion of her though! I liked the story within a story structure in this chapter. I loved finding out about the background of the three rogues. And the fights they had with the masked stranger. Brilliant! I wrote about the missing reunion scene too. Goldman is just full of tricks, isn't he?